Spring time is here and so are the big peacock bass! Spring is here and the fishing really starts to heat up all over Florida from the Florida Keys and backcountry to offshore and the local lakes and canals....It's a fishermans dream right now. Spring Time fishing is awesome in my books, the fish are waking up from their Florida winter slumber(I know people... what Florida winter?) but it does get chilly for a few days or weeks and many Florida fish really don't like it and go deep or deep in the backcountry to stay warm. One fish that loves spring Time and the warmer weather is the ferocious peacock bass. They hate the cold and once spring arrives and the warmer weather they bounce back with a vengeance! The peacock begin to spawn and you will find some nice quality size fish both female and male in good numbers. I've been fishing the last 4 weeks or so for them and this year the peacock bass fishing is on fire. "I have been getting viscous topwater hits on topwater jerkbaits, floating lures, crankbaits and suspending minnow type lures." Primarily during this time I exclusively target these fish sight casting for them with lures or flies. I mainly go after the larger males when I find them. I have been getting viscous topwater hits on topwater jerkbaits, floating lures, crankbaits and suspending minnow type lures. Lure color patterns that I prefer are tilapia, baby peacock, Mayan or golden shiner. I use Bullbuster Braid on my reels and 30lb fluorocarbon to prevent any cut offs. Yesterday while fishing I was getting hard hits just off the weed line and then the fish were digging down along the rock ledge...not using floro would have meant losing some quality fish. 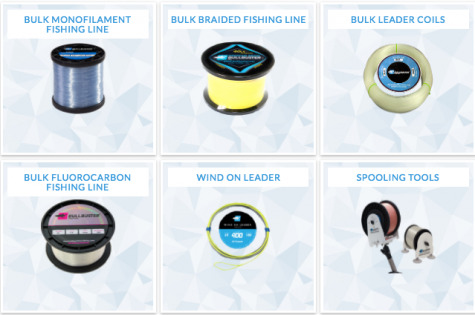 Bullbuster.net has a great selection of fishing lines for what you will need. With the sun beaming down it's imperative that you use a quality pair of polarized glasses to help you see the fish. I can't tell you how many times I'm fishing with someone and I see a fish and tell that person to cast at it and they can't see it because they don't have good glasses. Remember as the weather heats up the peacocks will be meaner and faster! While working your lures or flies be ready for a hard fast strike at any time. Have your drag ready to prevent any hook pulls or breakoffs. I have been catching good quality peacock for the past 4 weeks so get out there and catch some fish you won't be disappointed! Stay tuned this weekend I will be heading to the Gulf of Mexico to go after some big fish! Remember to order your fishing lines and tackle @ www.bullbuster.net Spend More Time Fishing!